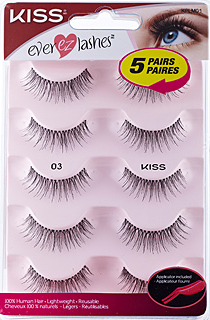 The Ever EZ lashes are super affordable & come with 5 pairs! Which is a good amount for what you're buying them for. This lash set not only comes with five pairs of lashes but a super handy lash applicator tool. I thought this tool was pretty helpful especially since I am still really getting the hand of lashes & still trying to find my perfect application technique, & this helped, however I don't think it's "The one". The set that I am sharing with you today are "KPLM01 – Natural" which are very beautiful natural looking. They're not too thick long or flared out. One of the things I love about the EZ lashes is the packaging. I don't know how many lashes I have ruined just trying to get them off of the plastic. However with this packaging there is a slit on the plastic which allows you to bend it & which allows you to take them off safer. Now for the before & after. Here is a picture of my eyes before the lashes. & here is a picture after I did my makeup & applied the lashes. In the before picture you can see that I have very short eye lashes, so I really enjoy wearing these on days when I just want to feel a bit more presentable but not overdone. & With them it actually looks like I have naturally gorgeous lashes. Also if you take care of them you can use the same pair a few times before throwing them away. I would really recommend checking these out next time you're at walmart. They sell for roughly 12-13 dollars. I really enjoyed my experience with them. They're super accessible, affordable & good quality.